Ever since the old expanded universe was re-branded "Legends" and rendered non-canon, fans have been wondering which elements might be brought into the new canon. So far, it's been mostly limited to small references like planets or minor characters in books. But that may be about to change. According to a new report from our friends at MakingStarWars.net, a fan favorite Legends character will be appearing in the third season of the animated series Star Wars Rebels. As usual, there is a chance this may not be accurate, but if you are trying to avoid all Star Wars Rebels spoilers stop reading now. This is you SPOILER ALERT! According to MSW, Grand Admiral Thrawn is slated to appear in Season Three of Star Wars Rebels. The famous Imperial officer first appeared in Timothy Zahn's novel Star Wars: Heir to the Empire in 1991. He was a tactical genius and rare instance of an alien rising through the ranks of the Empire. "From the sound of things, we’re going to see Thrawn as the tactical genius of capital starship warfare he was to Expanded Universe readers in the ’90s. However, this time he will be using his evil brand of genius against the the heroes of the starship Ghost. The future of Star Wars Rebels will also feature an Ezra with a short haircut and a lightsaber similar to Obi-Wan’s/Luke’s second saber. It sounds like the timeline moves a lot closer to A New Hope and Ezra’s design will reflect that." For what it's worth, we've been hearing similar rumblings about a future appearance by Thrawn in Star Wars Rebels. I think bringing Thrawn into Rebels offers up huge story potential and it will be a huge moment in Star Wars fandom when he shows up. We know the people behind the scenes on Rebels are big Star Wars fans and will treat the character with the appropriate reverence. 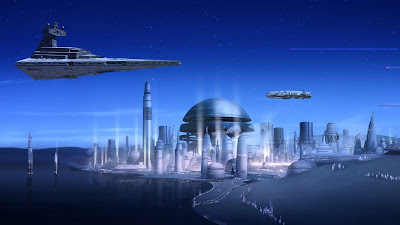 Rebels executive producer Dave Filoni is fan of Timothy Zahn's "Thrawn Trilogy" from the early 90s, and even incorporated one of Thrawn's tactics into the Season One episode of The Clone Wars "Storm over Ryloth". Are you excited by the potential for a Thrawn appearance on Rebels? What other "Legends" characters brought into the new canon? Let us know in the comments! Mike, the films take place too long after the Zahn trilogy. But if [spoiler] is the [spoiler] of [spoiler], than possibly the bulk of the Zahn trilogy could still be shoehorned in between VI and VII as cannon. Would explain who someone's mother is. No doubt Thrawn will be portrayed as being useless and constantly outwitted by the crew of the Ghost. Why use Thrawn? What happens in the EU should stay in the EU. So much for that creative freedom Disney loves to proclaim. Rebels won't do him justice and that is the truth. People love Thrawn because he was calculating, intelligent, and cunning. What part of those 3 words embody Rebels where the good guys always win? Existing in Rebels won't validate the Thrawn Trilogy. The man can exist and still have stories outside of canon about him. Lando exists in legends and canon, as does Tarkin, Leia and some others. That said, as Rebels has a large focus on the Jedi, we keep seeing Vader's help. Vader had peers (whether he knew it or not) in the EU. I would most like to see Mara Jade, though I am unclear as to her age and if she would be around yet. This opens the idea that Mara could appear at some point. Perhaps an appearance with the Emperor as he is looking over potential inquisitor recruits that will be chosen for a "new" program. Someone asked how old she would be, she is about the same age as Luke and Leia. Perhaps a couple of years older even. So Im thinking, around Ezra's age. So I can see in maybe next seasons episodes, a standoff between Ezra and Mara. This makes Thrawn - or at least some version of him Canon. Curious. While obviously the Zahn books don't fit with the Canon, the characters nature should remain the same. Begs the question, could Thrawn be related to Snoke somehow. Could Benicio Del Toro mystery villain actually be Thrawn in VIII. It would be AWESOME if they did a Rebels style Thrawn Trilogy mini series special. Obviously ultered slightly to fit canon. I was wondering if Zahn would consider rewriting the books to fit in. That trilogy is some of the best Star Wars. Can anybody explain summarily who grand moff thrawn was and what did he do in the novel ??? 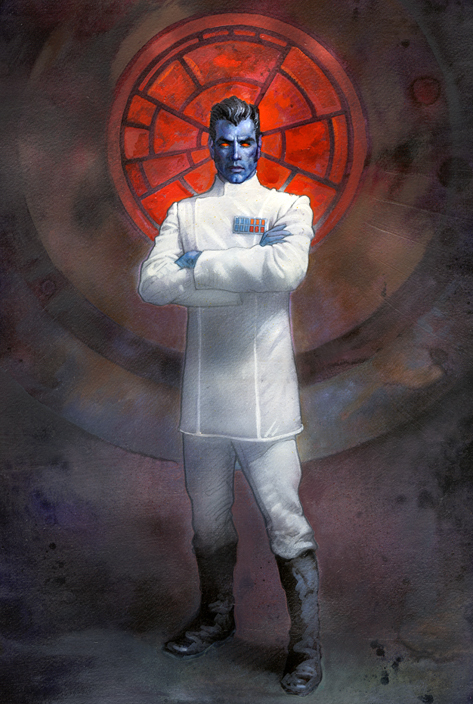 Grand Admiral Thrawn was a Chiss who worked his way up the Imperial ranks as one of the only aliens to achieve such a rank. He was a master strategist who would use a species' artwork to figure out their tactics in space combat and war. I highly recommend reading the Thrawn trilogy. Very entertaining, in my opinion. Like he said. Thrawn is an awesome antagonist and is easily one of the best antagonists in Star Wars period. Like what the guy above me said, the Thrawn trilogy is very good. If only get into one story in the EU, the Thrawn Trilogy is the must read above all orders that I've read, aside from the other books I have read which were done by the same author. There are numerous instances of real world people and events taking on "legendary" status over time. Perhaps the tales become larger than life, more colorful, or idealized over the ages. They are still usually based on real people and real events. Using Thrawn would reflect that. If you are a fan of the EU, this is a good thing. Enjoy it. I am sure this is gonna happen. I think the mysterious character at the end of Aftermath is Thrawn. I am super stoked. Well, RIP Thrawn. Another legendary character will be ruined and rendered as totally incompetent and useless fool. Well played.